Silver Arrow Knits! : Are You Jonsin' for Ravelry? Are You Jonsin' for Ravelry? Yesterday I received my invitation for ravelry. OMG. I can't stop visiting this site. I will be trying to write therapy notes and I will decide that I need to add a project to my queue. I will be trying to prepare for a lab meeting and I will decide that I need to upload pictures. This site feeds my OCD tendencies. I literally spent about 2-3 hours recording my yarn into the stash folder. I am planning to take pictures of my yarn, so my stash section will have pictures. My name on ravelry is silverarrowknits. I am sure you have been wanting some pictures. My camera hasn't been working, but I think it is fixed (and by fixed I mean actually charge the battery), so I will have new pictures for my next post. For today, here is a picture of Argosy as it was about 1 year ago. In fact this is longer than what it will be come Sunday. Remember how the stitch count wasn't working? Well, I thought I had forgotten to cast on 8 stitches within the past couple of days. This was not the case. About 12 inches ago, I forgot to cast on 8 stitches. I wasn't going to rip back, but I might. I will know I forgot a pattern repeat, even though no one would ever notice. 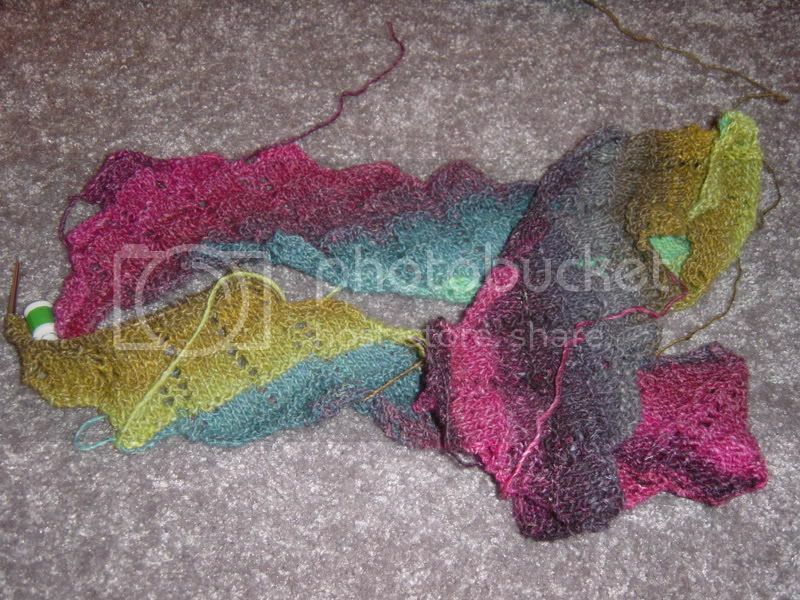 I am using Noro Garden Lite and I figure if I am going to use the good stuff, I should get the pattern as perfect as I can. (cue zombie soundtrack) urhhhhhhhhgh....wellllllcome to the dahhhhhhhk side. There's some addiction being generated in lots of people by that site! Maybe SARU should change their research focus soon...no. I'll keep my Ravelry addiction, thanks.